The London Gold Fix has been a regular feature of the international gold market since Friday, September 12, 1919, when the five gold pool members met for the first time, at the premises of the London merchant bank N.M. Rothschild, and with Rothschild as the chairman. On April 8th 2004, N.M. Rothschild announced that it was withdrawing from the gold market. On the morning of Monday 5th May 2004, gold was fixed as usual, but by a telephone conference between three market member in London and one in Paris. We sell Rothschild gold bars, when we can get them. 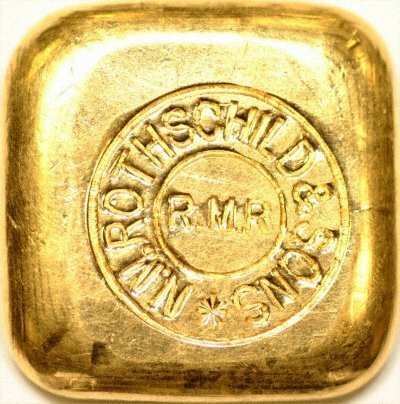 The withdrawal of Rothschild from the gold market has intensified interest from collectors of their bars. Shortly after the Rothschild surprise, another market maker AIG also quit as a market maker. London gold fix prices can be found on the site of the LBMA, the London Bullion Market Association. Gold Price Future - Up or Down?